Thanks for downloading Vittle! There are a lot of powerful features to discover. Don't worry about learning everything right away. Bookmark this page to refer to as you use Vittle more. Make sure to check out examples of what folks are doing with Vittle on the web. This Guide covers the features found in the Full and Pro Editions of Vittle. Most of the basic features are the same in the Free Edition. When you record for the very first time, you will be prompted to allow access to the Microphone. Please enable this, then tap Record again to start your recording. This may also result in an additional zero-length scene being created at the beginning. You can safely delete this in the Scene Editor. If you accidentally tapped "Don't Allow", open the Settings App to Privacy \ Microphone and turn this on for Vittle. It is important to enable this to record correctly. If you wish to mute the mic, there is a setting in the Info menu. The Gallery shows your collection of Vittles. Each Vittle contains the project files and the videos that are recorded. Tap '+' in the upper left to add a new Vittle. Tap on the thumbnail to open it. Deleting & Renaming: Tap on the Vittle's name to rename, duplicate, or delete it. Search: By default, the most recently edited Vittle shows up at the top. Scroll past the top of the page to see the search and sort buttons. Enter text into the search box to filter Vittles by parts of their names. Tip: Add a mnemonic or tag to your Vittle names (e.g. "HST302 The Renaissance") to easily categorize and manage large numbers of Vittles by searching for the tags. Tap the info icon in the top right to show the info dialog with links to the Online Guide and Email feedback dialog. Zooming and Panning: A key feature of the Inkflow Engine that Vittle uses is that you can always zoom and pan using two fingers. The view starts off centered on the canvas, which is exactly 4 times larger than the visible screen. This gives you a lot of room to work. It's easy to move things around and resize them, so you can start anywhere. Drawing: Select the Draw button at the far left to enter drawing mode. Draw using one finger. Zoom in to write more finely or to add detail. 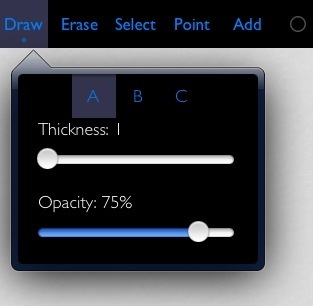 Full Edition Tap the Draw button when it is already selected to see the Pen Thickness and Opacity settings. There are three presets you can customize. Tip: The small circle below a button title indicates there are additional options. Change the opacity to a low value (e.g. 10%) for a pencil-like effect. A low opacity + large thickness gives a color-pencil or brush effect. Pencil-Only Drawing Mode: If you have an iPad Pro with the Apple Pencil, you can toggle on the Pencil-Only Drawing Mode using the Pencil button at the lower left. When activated, only the Apple Pencil can be used to draw, so no more stray marks. You can continue to use your fingers to zoom, pan, or select. 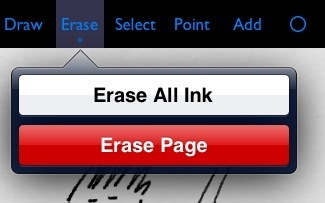 Erasing Ink: Tap the Erase button to enter erase mode. Tap and Hold the Erase button to see options to Erase the whole page. Full Edition Tap the Point button to enter the laser pointer mode. A red pointer will appear wherever you point with one finger. Tap Rec to start recording. Everything on the visible canvas is recorded, in sync with your voice. Tap Stop to (you guessed it) stop recording. You can then tap View to review your Vittle. Full Edition In the Full Edition, each time you record, a new scene is added to the end. The individual scenes can be later rearranged or deleted in the Scene Editor. Tap on any of the four round color wells to change the ink color. Full Edition Tap on the selected color well again to open the color customizer. Pick from one of the presets, or make any color you want. Tip: Tap on the #RGB value to enter it directly. On an iPad, tap the Add button, then select "Add Photo" to select a photo from your albums. On an iPhone, enter Select mode, tap on an empty part of the canvas, then tap "Add Picture". Alternatively, while in Select mode, tap on the empty canvas, then tap "Add Picture" in the context menu. Tip: If you had denied access to photos the first time, you can re-enable it by going to the iOS Settings App -> Privacy -> Photos, and turning the setting on for Vittle. Full Edition You can also copy images from external Apps such as Dropbox or Mail. Simply copy the image from that App, switch to Vittle, then paste it in. Selecting: Tap on the Select button to enter selection mode. Drag your finger around the ink you want to select. Zoom in if you need finer control. Once selected, drag the selection to move ink around. To delete ink, tap inside the selection, then tap delete. This is pretty handy when you're using different colors to denote multiple layers of a diagram. 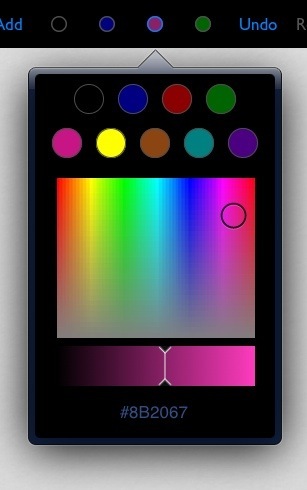 Tip: Tap on the canvas and tap “Select All” followed by Color Separation to quickly select all ink of a particular color. Rotating Ink: Drag the circular rotate icon at the top of the selection to rotate the selected ink. Resize and Rotate Simultaneously: Use two fingers on the selection to resize and rotate ink at the same time. Cut, Copy, & Paste: You can also cut or copy the selection from the context menu. Once copied, tap anywhere on the un-selected canvas to paste. You can use this to copy ink to different pages or projects. 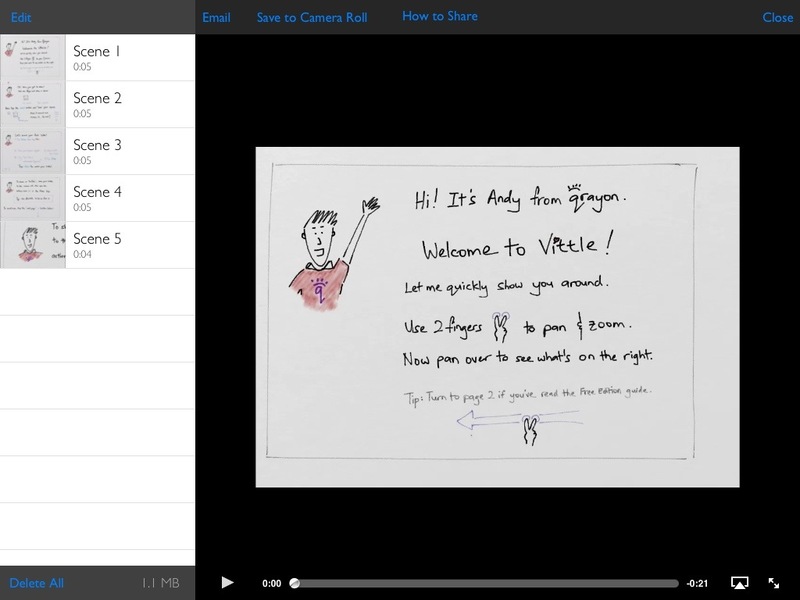 You can even copy ink and images from Inkflow into Vittle. Pro Edition Flip Ink: Tap on selected ink and select Flip Ink to flip it horizontally. Pro Edition Color Separation (iPad): Right after you lasso select ink, the Color Separation panel will appear in the lower left. Tap on individual color(s) to include in the selection. Now, further operations such as moving or resizing will only affect the selected colors. Page management: Tap on the page number to bring up the page management tools. Tap edit to rearrange or delete pages. You can also duplicate a page. Here's a more detailed walk-through of the Camera Lock feature. Tap the info button (the 'i' in the circle) to change the Editor options. Pro Edition 1080p Video: By default, Vittle Pro records at a high 1080p resolution. Turn this setting off to produce 720p videos. This will result in smaller files at the expense of lower resolution. Pro Edition Widescreen: Because the iPad screen is narrower than a standard widescreen video, additional content will appear at the sides of the video in widerscreen mode. Turn this setting off to produce "pillar-boxed" videos instead where the sides are blacked out. Pro Edition Trace Previous Page: Enable this to see a faint outline of the previous page (which won't be recorded). One way to use this is to prepare a template or guide ahead of time, then do the actual live recording on the next page. Pro Edition Export: Save your projects as multi-page PDFs, or the current page as a JPEG. Get Email Tips: We send out an Email newsletter every couple months or so with tips and tricks, as well as pointers to new tutorials, new Apps and advanced techniques. Don't worry, we hate spam as much as you. Your email is only used for this newsletter and is never sold to third parties. You can unsubscribe anytime by emailing us again. Tap the View button to open the Scene Editor. Share on YouTube: Use the YouTube App to upload your videos. First save your video to the camera roll, switch to the YouTube App, tap on the camera button and select your video from the gallery. Find more details on this YouTube support page. Share on your company server: You have full control over the Vittle video files that are generated. You can upload them to the server or service of your choice either directly from your iPad, or by first copying them to your PC or Mac. While Vittle includes all you need to record and make basic edits to you videos, sometimes you want to go the extra mile. You can open PDFs in Vittle Pro from Mail or third party Apps. When viewing the PDF, tap the "Open in..." button and select "Open in Vittle". You may have to scroll the list of options to find Vittle Pro in the list. This will create a new Vittle project with an image of each page of the PDF. These images are locked by default, but you can tap on them in Select mode to unlock and reposition them. You will typically want to import PDFs that are generated by a presentaion App such as Keynote or PowerPoint. The landscape orientation works best with Vittle. Tip: If you have an oddly-sized or very detailed PDF, a useful tip is to first import it into your presentation App, rearrange and resize the pages to fit your presentation, then export that deck to a PDF into Vittle Pro. 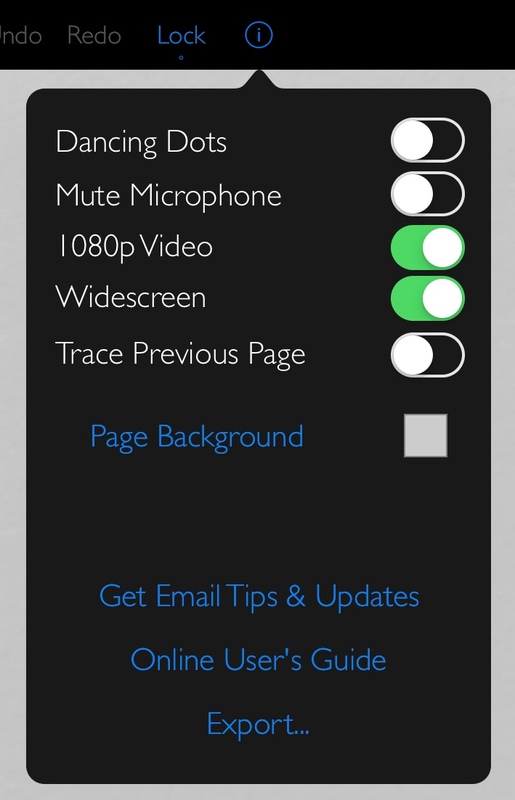 In Keynote, tap the "..." button in the top right and select "Send a Copy". Select "Choose how to send" if the menu doesn't appear. Scroll the list and select "Open in Vittle Pro". This covers just the basics of what you can do with Vittle. We publish advanced tutorials from time to time on our blog and email newsletter. Sign up for it here. To start with, here are three simple ways to practice telling stories using Vittle. Emergency Medicine by Rahul Patwari (most videos go into medical detail, but start with this one on the Affordable Care Act for general interest). BOGOBiology, which includes a nice tutorial on using Vittle, plus tips on using some of the advanced features. Suggest another video to feature. Follow us on Twitter to be the first to hear about new Apps and get FUN (+free) stuff just for fans. 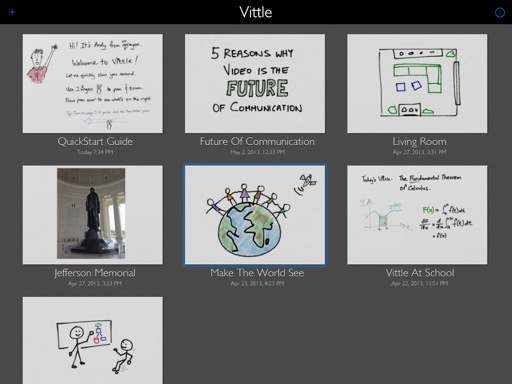 If you like Vittle, also check out Air Sketch: Turn your iPad into a wireless whiteboard. Back to the Vittle homepage.